The Cortec VpCI 126 series zipper closure bags are the latest in corrosion protection for all your metal products. 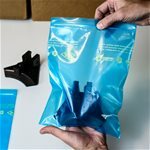 Sealing your items in these easy-to-use bags will protect them from all types of corrosion and is much easier than using conventional oil preventatives. With VpCI there is no time-consuming degreasing or coating removal process. The bags are transparent so you can easily identify the parts inside. Metal parts packaged in Cortec VpCI-126 Blue receive continuous protection against salt, excessive humidity, condensation, moisture, aggressive industrial atmospheres and dissimilar metal corrosion. The Vapor phase Corrosion Inhibitors vaporize and then condense on all metal surfaces in the enclosed package. VpCI reaches every area of your part, protecting its exterior as well as hard-to-reach interior surfaces. You get complete product protection during storage as well as during domestic and overseas shipments, virtually eliminating any rust claims. FDA approved and recyclable. The shelf life of VpCI-126 film is 2 years.